Panoramic view of the Toyama Firing Range (戸山射撃場, Toyama Shagekijo) in Okubo (大久保), Tokyo. In 1874 (Meiji 7), what was then called Toyamagahara (戸山ヶ原) was requisitioned by the army. A shooting range for the Imperial Guard was established here in 1889 (Meiji 22). After the Sino-Japanese War (1894–1895), the firing range was developed into a state-of-the-art facility, believed to have been the biggest in Asia. It consisted of seven 300 meter long reinforced concrete buildings into which soldiers shot their automatic and other weapons. 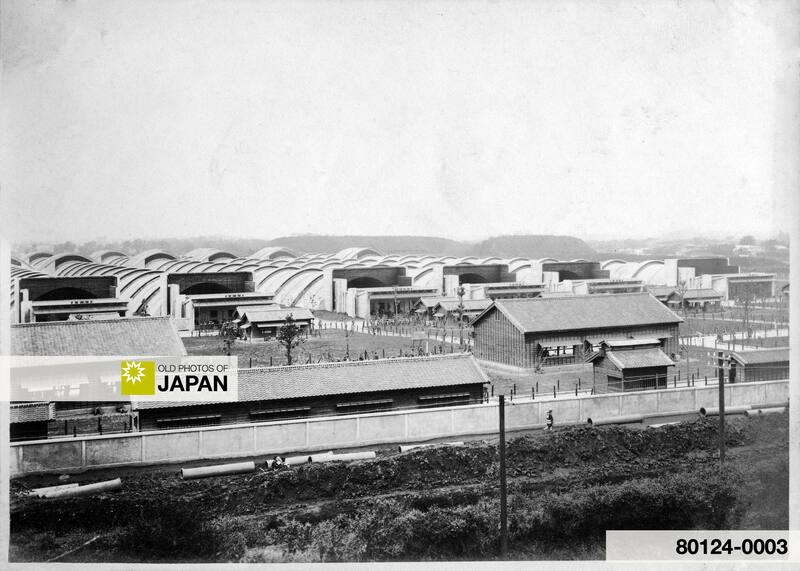 Although originally an isolated location in the countryside, Tokyo soon expanded into the firing range’s surroundings. Therefore, high walls, visible on this image, were built around the compound. After the end of WWII, the facilities were used by the American Occupation Forces. The shooting range was demolished around 1960. The area now houses the Department of Science and Engineering of Waseda University (早稲田大学理工学部). This photos is from a private photo album of a member of the Japanese Imperial Guard (Konoe Shidan) who served between 1928 (Showa 3) and 1930 (Showa 5). You can also licence this image online: 80124-0003 @ MeijiShowa.com. My name is Samantha , and I represent Media.net. I’m interested in doing an ad deal with you similar to what you already have with Google AdSense. I think we can run some very relevant ads that will get good click-throughs. Media.net is currently advertising on many Com score top 1000 sites like Yahoo! (Local/Shopping/etc), Entrepreneur, and Bank rate. We get phenomenal results for our publishers. Please let me know a good time when we can talk.